And then I was here. After a busy term at school, a typically hectic end to it, a rush to pack and a flight back to the UK, a few magical days in Northumberland and a train journey down to London and across the city to Richmond, I was here, back at St. Michael’s Convent. A number of years ago, my spiritual director had asked me where I went on retreat, and I had told him, sheepishly, that I didn’t. His reaction was straightforward; that won’t do. And he followed that up with two recommendations for places I could easily go. Since my brother lived in London at the time, I decided to come to St. Michael’s. I remember arriving for the first time and feeling rather anxious, because I really didn’t know what I was supposed to do, and I was wondering how on earth I was going to spend the next three days. The sister who showed me around gave me all the information I needed then left me in my room. I knelt to pray and found myself crying, not knowing why or for what, but just letting it all come out. The following year I was back, this time with a version of the Cloud of Unknowing and a bit more idea of what to do and how to use my time. I felt more comfortable attending the daily offices, and found that attending them all gave my day a focus and a rhythm that very quickly took me away from all the cares and concerns I had arrived carrying. More of the meals were ‘talking meals’ and one evening the sisters had a lively discussion about who would go to Compline and who would be able to go straight to the sisters’ private sitting room to watch Midsomer Murders. I continued for several years, but in 2012 and again in 2013 I just couldn’t make the dates work and had a retreatless summer. Last year I went to Norwich and called it a retreat, but then spent a lot of time talking to people and felt irritated that I didn’t have the same feeling of peace and slowing down that I had after my visits here. And so I decided I really needed to make the dates work somehow this year, and just managed to squeak in for a retreat before the house closes for the summer. I also arranged a visit to Norwich, but decided I needed to reframe that as a short pilgrimage, rather than a retreat. So here I am. I arrived almost twelve hours ago, just in time for the midday Eucharist. I have once again come here with a copy of Julian, but this year I have the Mirabai Starr translation. I attended Evening Prayer and Compline, and while neither was the form I am used to, since I am more familiar with the Episcopal Church’s BCP daily offices, the form no longer has me stranded or caught in the headlights. I know I can find my way through and know what I’m doing. 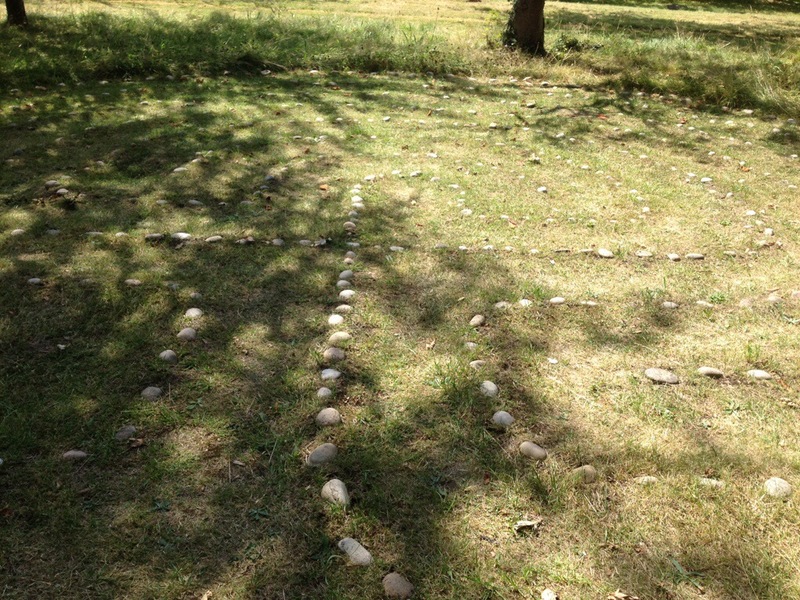 This afternoon I spent some time in the garden and walked the small labyrinth. Not really knowing what to do, but having the space all myself, I took off my shoes and walked slowly, reciting one word of the Jesus Prayer for each step, then stopping to pray for whoever or whatever came to mind. I went slowly, gently, and found myself unpacking all the prayers that have been part of my daily intercessions, round and round, until I had prayed them all out. A squirrel sat in the grass only a few metres away and watched me intently. It was nice to have a little company in that green space. I shall do it again tomorrow, and try to find a way to incorporate some kind of walking meditation into my prayer life in Tokyo, because it just felt so right to walk, and pray, and raise each person or concern up and let God take care of it. I put my shoes back on and walked through the garden feeling reassured that I had given my concerns to God and that truly, all shall be well. This entry was posted in Prayer, Travel and tagged all shall be well, daily offices, Ham Common, Julian of Norwich, labyrinth, Norwich, Richmond, Sisters of the Church, St. Michael's by tokyopurplegirl. Bookmark the permalink.